My normal policy is to turn off the TV and radio during State of the Union addresses, no matter who’s President, but there’s been talk of a State of the Union protest at the Capitol tonight, so I walked down there after dinner to see what I could see, not having been to one of these events before, and eager to photograph potential crazies. 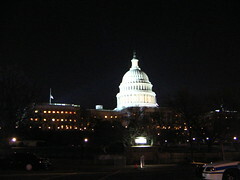 At left, the scene at North Capitol Street and Louisiana Ave NW: a tough security perimeter all around the Capitol, with huge, bright floodlights atop various buildings shining on the Dome. I almost turned back right there, thinking the flares were to define an off-limits border for pedestrians as well as cars, but seeing a biker go nonchalantly go through them, I decided to keep going. 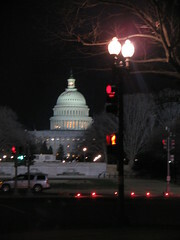 A CHPD officer told me that as long as I approached from the far side of 1st St NW I was okay, so that’s where I went. 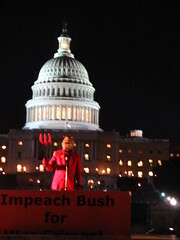 Over by the Grant Memorial, someone dressed up in a Devil costume with a Bush mask brandished a pitchfork about and pantomimed to a live audio feed of the SOTU address from behind an “IMPEACH BUSH FOR WAR CRIMES” banner table, while various protestors waved signs and jeered rebuttals at the mascot. It was a pretty thin crowd, probably not more than 25-30 of them. 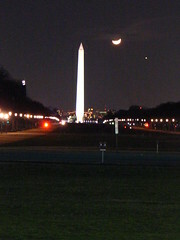 The NPS and CHPD security personnel I talked to, were pretty glad for that. 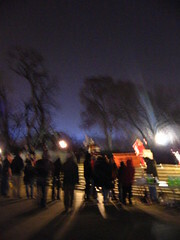 Full SOTU 2007 photoset on Flickr, and more on DC Metroblogging.